This month's favorite company is STAMPS BY JUDITH AND HEATHER. 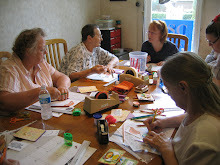 Their stamps were used in the First Friday's FREE Make N Takes. Who can resist that adorable MOOSE or those cheerful BIRDHOUSES!!! Love love love their stamps!! !